Genuine Anti-Gankers continue to have fun while using the already-available mechanics and emergent techniques. A few angry boys in the ganker community will always try to deny that fact. Just because they're outnumbered by the whiny carebears doesn't mean real Anti-Gankers are inexistent and ineffective. Today we will see how, even with limited numbers, their vision and courage can combine with saving the glory of Amarr ships while applying Advanced bumper care. I would usually name this type of post "Advanced Machariel Maintenance", but today's victims have their own style of bot-aspirancy. Armin Soprano is another brain-washed heretic who likes to bump freighters endlessly, and then provide warp-ins to bot-aspirant Catalysts. Until now, there's nothing new. Nevertheless, in addition to reminding me the name of my favorite Trance music producer, he was using the Omen Navy Issue contrary to the majority of other bumpers in Machariels. Quite original at first sight, isn't it?… Not really. The Amarr Emperor would have an heart attack if he saw this glorious ship ram into freighters. Thankfully, Anti-Gankers enjoy ganking the freighter bumpers just like they enjoy jamming fail-fit Catalysts. Armin seemed to have some microwarpdrive and probe launcher to enhance his freighter hunt. However, at least two slots were empty: spatial awareness and bumping permit. Content Generator Slania Auduin arrived to the scene and quickly cured the disease by ganking this bumper and liberating the golden Omen Navy Issue from Armin. Slania knew how to deal with the heretic. He chose the Amarrian Harbinger to bring the symbolic justice. "The Harbinger proclaims its status as a massive weapon, a laser burning through the heart of the ungodly." Meanwhile, Content Ruiner CONCORD Police Commander brought the blessing to Slania, but the Omen Navy Issue's wreck remained as a symbol of the successful punishment that was delivered to the bumper. Of course, the bumper's pod was not forgotten. Hell, even Catalyst pilots dislike bumpers. According to the data, it was dealt with two minutes later. If correct, it turns out that the bumper was probably AFK-aspirant as well, what an ugly violation of EVE's basic rules! …which resulted in this intervention from Jennifer en Marland who knows the mechanics like no other. Ladies and gentlemen, there is no end to bumper bot-aspirancy: only four hours later, Armin was once again spotted performing his illegal activity in his Omen Navy Issue. Will they ever learn? All high-slots were empty. Apparently, he learns backwards. Still no vigilance, still no permit. Guess what happened again? 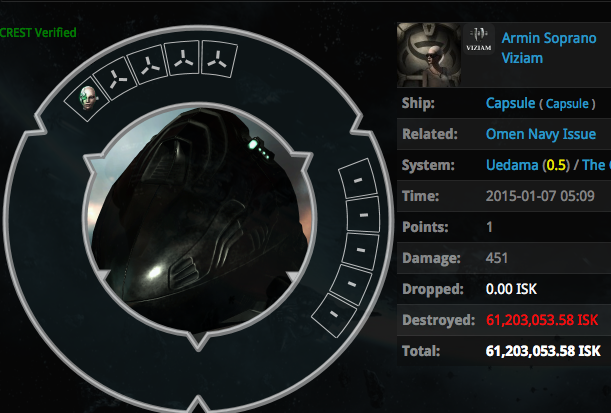 Content Generators HC Androidson and Cpt Levi Gankerman intervened to show that there's no %100 safe space in EVE, and Armin's Omen Navy Issue vaporized again as a result of a successful gank. Most of the time, it's extremely easy to save a pod. Since he was focusing so much on the Obelisk, Armin had a hard time figuring out how to do it. The bumper failed to survive again. All this wouldn't happen if he had paid attention to his surroundings and pledged loyalty to us by purchasing an exclusive bumping permit. However, the Emperor's faith in the Omen Navy Issue was restored after these three exemplary operations. 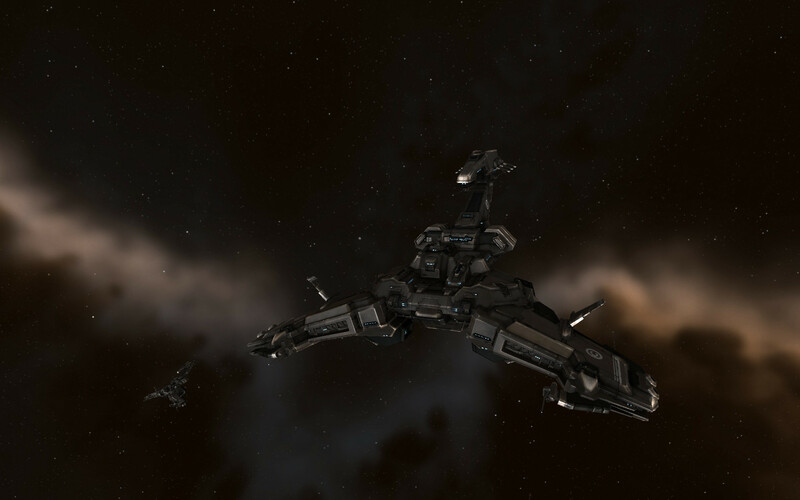 Meanwhile in Lowsec, Koh Baelfire was busy staring at an asteroid belt in his Coercer. Was he aspiring to become a ganker? If so, he had accidentally jumped into our lovely Lowsec. But that's just a detail. 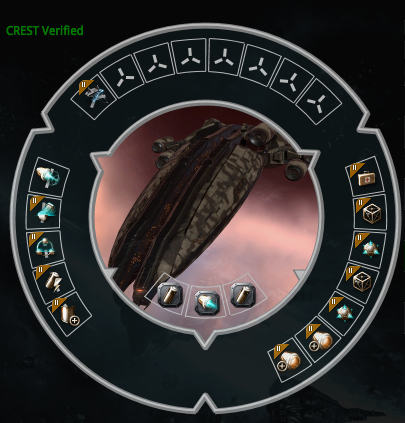 Most importantly… does he deserve to fly such glorious ship in the dangerous EVE space? Does he check Local and D-Scan? I wanted to test his spatial awareness level. Back in those days, I was -10. Therefore, he could guess that my Skiff was probably not that peaceful when he sees me in Local and D-Scan, or as a bright red pilot on his Overview. But did he even use these vital tools? 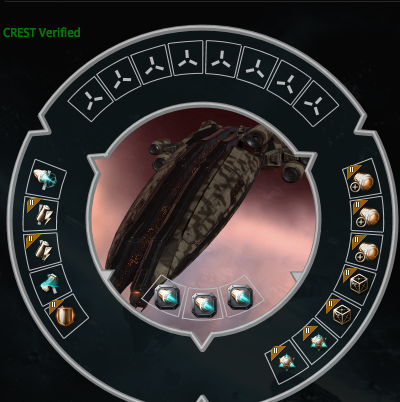 The one thing I notice though… even this Coercer destroyer fit looks better than Armin's disgusting bumping-optimised "cruiser". However, our Skiff of Justice arrived to the scene and punished this ganker-wannabe who, judging from his behavior, didn't deserve to fly this golden ship. Content Generator Sansha's Ravisher also celebrated the moment by contributing to our operation. 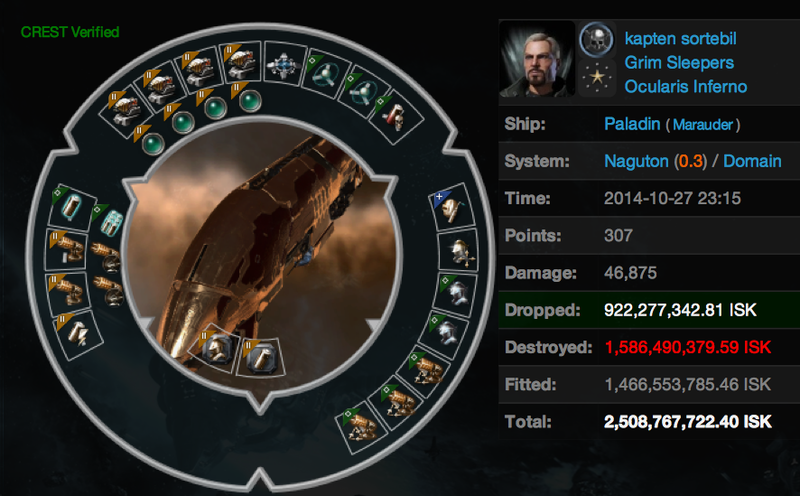 His pod was then dealt with thanks to our Skiff of Doom's awesome mining capabilities. 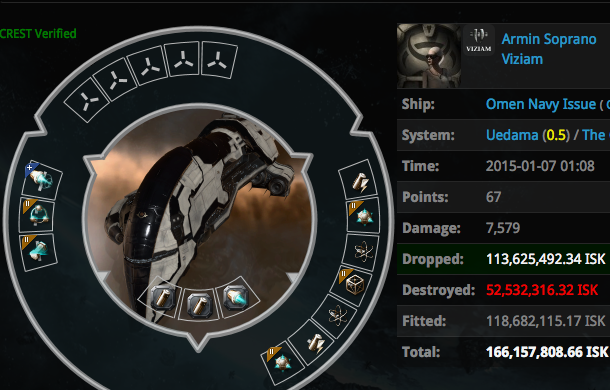 Besides this Lowsec Coercer, the first part of today's post shows once again that both Gankers and Anti-Gankers continue to enjoy EVE and keep Highsec alive with their own ways and tactics, while the angry carebears cry for another nerf or spew insults because they lost their precious Covetor. Real Anti-Gankers don't cry for more nerfs on forums, they log in and play the game. Player interaction will never die no matter how much carebear whining tears flow. 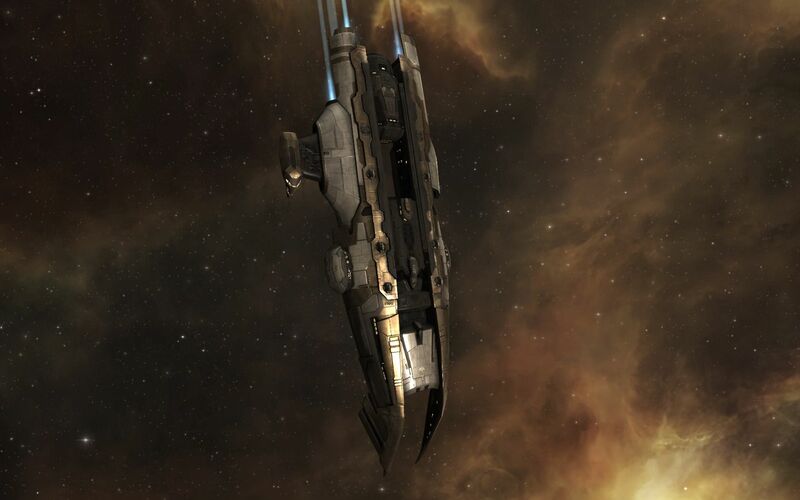 What matters is the existence of a Highsec that makes us say: "This is EVE." 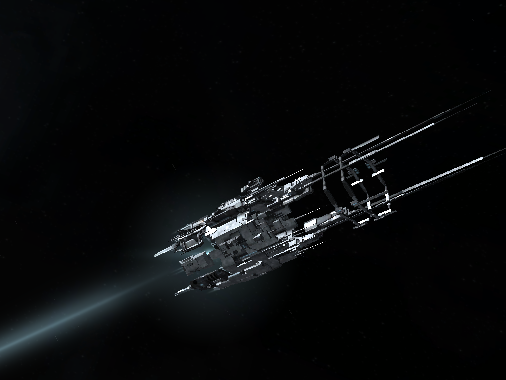 Highsec is fun, but Lowsec is even more fun. It is time to visit our dearest Lowsec shenanigans. Reading these names is like reading an epic story with depth and reputation. Therefore, one cannot let anybody darken that reputation. 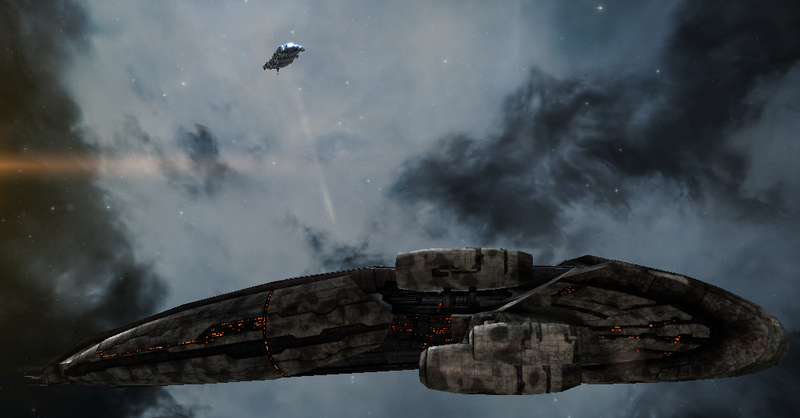 Encouraged by these thoughts, I was once again flying my Maller in the ominous vastness of Amarr lowsec. During my travels in space, I was of course refreshing D-Scan very regularly, and some Omen was appearing on scan results. 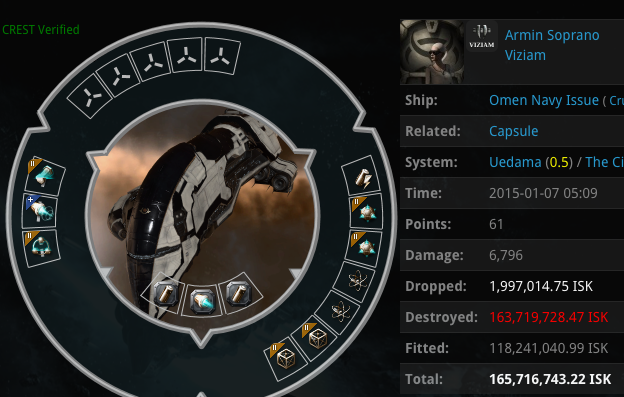 Whenever you see a ship on D-Scan in Lowsec, it is important to understand who that ships corresponds to in Local chat. At that moment, besides my corp mates, there was Edau Skir in Local. Most probably, he was the Omen. The 5 degree scan result was showing that he was either in Belt III-1 or III-2. What was he doing there? Ratting maybe. 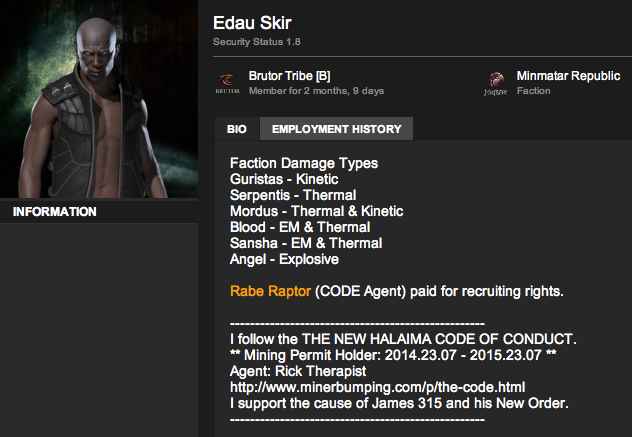 I did the usual Show Info, Biography and Employment History check on Edau Skir. However, sometimes the character Biography alone explains everything. A ganker-aspirant? In our lands? Why, hello there. Besides his peaceful face expression, Edau Skir seemed to be another brain-washed heretic who was just lost in our lands. His Biography was filled with worthless and irrelevant statements like "Halaima Code of Conduct", "mining permit", "recruiting rights" and "agent". Disgusting. Moreover, he was darkening the glorious honor of the Omen by flying it with a "mining permit". Something had to be done. Individuals like Edau Skir are never seen as a sane type of capsuleer. Edau Skir had the chance to warp away before we warp on him. After all, he had all the tools required: Local, which was showing like 7 flashy pirates and D-Scan results with mostly cruiser-size ships. Anyone who regularly makes use of these two simple tools can drastically increase the chance of survival. It is important to respect a capsuleer who checks D-Scan, Local and pays attention to his surroundings. Since there were two possibilities, I warped to belt III-1 while my friend warped to belt III-2. Much to my surprise, I landed on top of the Omen which, judging from its unaware pilot, was more like holding a "Kill Me!" sign rather than a "Mining Permit". "Il est la, dans trois-un, trois-un!" I said on comms. ("He's here, in three-one, three-one"). A counter-permit task force started warping to the area to cleanse the historical and glorious cruiser haunted by Edau Skir. Content Generators Azov Rassau, oxxo Malukker, Futu Lepoulpe, Sansha's Ravisher, Spok spok and ExoHoffmanN cured the disease and liberated him from his "mining permit" holder Omen. Edau Skir should have bought a ganking permit instead of meaningless things like "mining permit" which is now doomed forever. Another brain-washed heretic was driven from our lands. It could be said that the spirit of Anti-Ganking had combined with Amarrian glory. 10 days later, another hopeless case appeared. The person concerned, kapten sortebil, was very similar to those angry, rude and clueless guys who like to talk big without acting successfully (just like those angry carebears who appear in channels like Anti-Ganking, Mining. the kind of people that many people like to confuse the real anti-gankers with). In fact, the first round of Local chat babbling started with another member of his team coming from a wormhole and talking about their willingness to engage in an arena type, fair, "all-equal" fight... in a sandbox like EVE. [ 2014.10.27 22:47:27 ] Vertnormalia > 5v5? [ 2014.10.27 22:47:49 ] Vertnormalia > or you too scared? Vertnormalia wanted equal, honorable and a fair fight. He was quick to accuse us of being too scared. About half an hour later, Vertnormalia's friend in a Paladin (Amarr marauder) finally arrived and started spewing empty words in Local. All of a sudden, EVE happened. 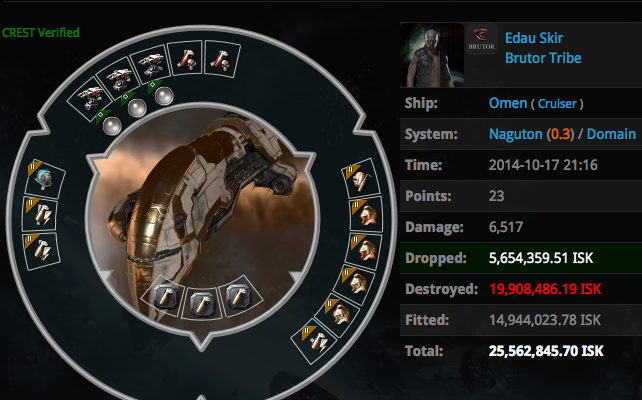 An already-coordinated team composed of ExoHoffmanN, Spok spok, kooozie, Azov Rassau, DaveGur and Nanotech Tazinas suddenly undocked and ambushed this talker in a Paladin even before his buddies in two Guardians and some other cruisers arrived. We pretty much had equal numbers in the system, which was what they wanted, yet kapten sortebil's "team" wasn't that organized. He was quickly liberated from darkening the glory of a Paladin with his bold claims in Local. About a minute after the Paladin's explosion, his "team" finally started to land on grid with two Guardians at range. Too late, buddy. Too late. Pay attention while playing at the undock. Talk less, do more. Just because you're in a Marauder doesn't mean you're God-like. Think about your actions. 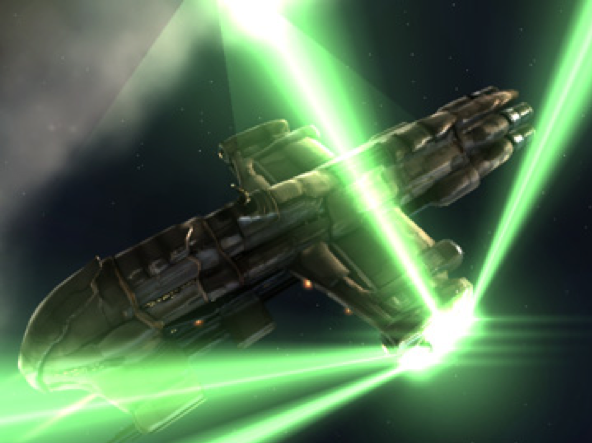 I recommend all carebears to leave Highsec and check out the gameplay of shooting things. Stop mining for a while. 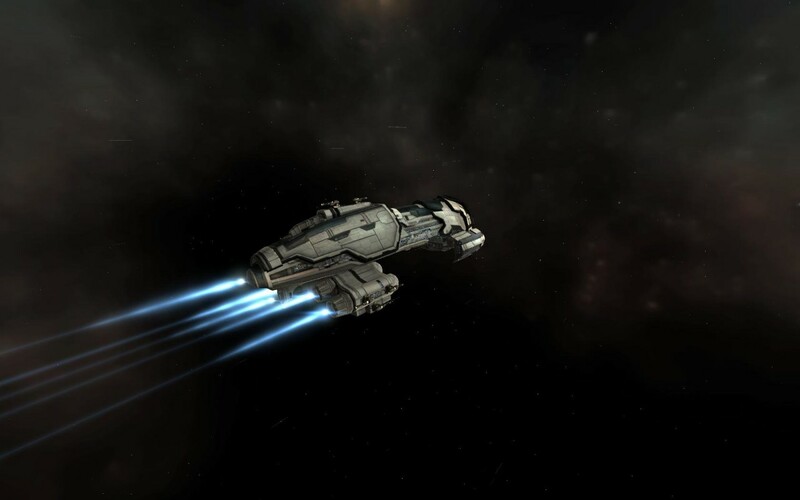 EVE space is full of action, surprises and fun content. As long as you're not like Edau Skir or kapten sortebil, you'll be fine. What matters most is the player decision, no matter where you are. It's one freaking merciless sandbox. One of the main complaints that come from AFK haulers is that there are no ways to counter bumping. However, reality says otherwise. It is a known fact that vigilant scouting and effective webbing are working ways of avoiding the bumpers. Unlike the angry, AFK and whining carebears, we like to use valid game mechanics. Anti-Ganking isn't all about jamming fail-fit Catalysts. 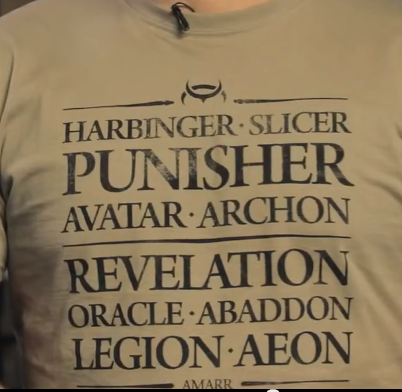 It is also about… ganking Machariels. Freighter bumpers are going down one by one in quite a regular basis. As any Anti-Ganker will tell you, there is great satisfaction in killing those Machariels. In Highsec however, laughable and robotic activities like freighter bumping results in strange-looking fits focusing on speed and agility. Therefore, although fitting some tank is important, spatial awareness is a lot more important for survival. Taishan Mandragoran doing his last cargo-scan with that Machariel, named "Travasek's Machariel" according to D-Scan results. Just like Taishan Mandragoran who was liberated previously, Siegfried Cohenberg believed he could safely bump freighters and provide warp-ins for the bot-aspirant Catalysts without any risk. Judging from his behavior, it is quite obvious that he thought he was 100% safe in Highsec while enforcing his robot-like bumping activity without having a bumping permit. After all, in addition to minimal scouting, anyone who checks Local, D-Scan and Overview grid can avoid losing a ship in Highsec. In fact, if you pay attention (=play the game), it's so difficult to die in Highsec that anyone who dies there probably wanted to die. Thankfully, Highsec is a competitive environment with many people from a variety of backgrounds. 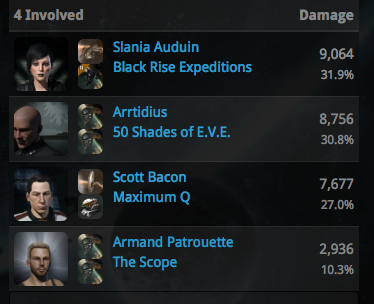 More and more people from Nullsec alliances, Highsec miners and Anti-Gankers are eagerly training their main's/alt's blaster skills to enforce this generous activity as follows. Siegfried was once again aspiring to be a bumping bot in his Machariel. He had a Damage Control II (we don't know if it was even active at all) and Large Shield Extender II, nevertheless, his bumping permit slot was empty. Content Generators Agent Tom, Jennifer en Marland, Slania Auduin and Armand Patrouette saved him from his brain-washed tendencies by bringing justice and punishing his Machariel. 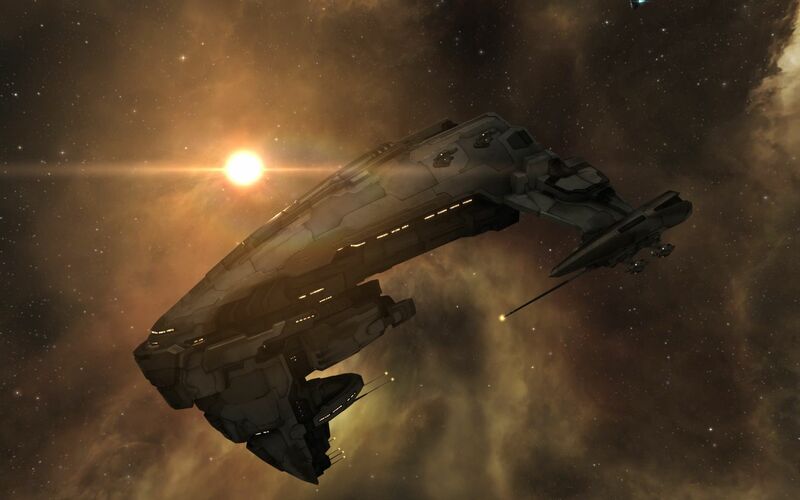 Soon after being liberated from his bot-aspirant Machariel, Siegfried started babbling in EVE forums again, talking about why freighter pilots should pay him for a safe passage. Bumper education is a process with a duration that depends on the bumper's willingness to learn. Judging from the above statement, it looks like someone needs to be ganked again. bot-aspirant when they start bumping freighters. 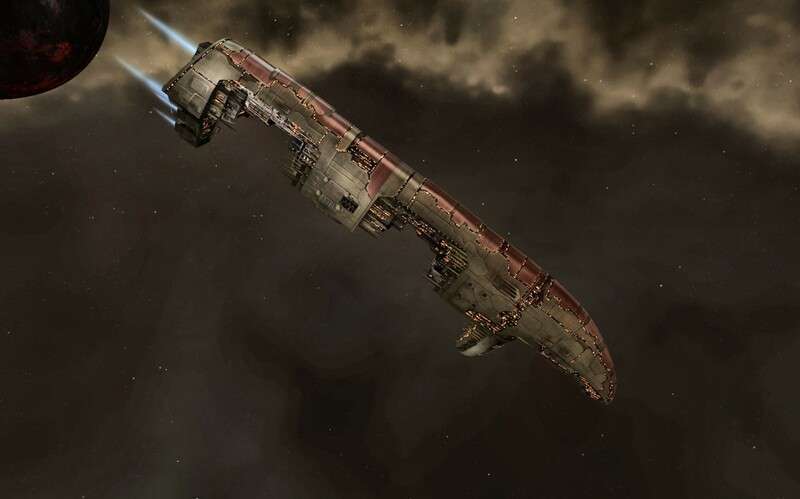 Freighter bumping, in itself, constitutes the apogee in the list of robot-like and boring things you can do with the ruthless Machariel in EVE. Apex Aubaris is a known and respected fleet commander of Spectre Fleet and other shenanigans. Considering the mental state of Siegfried and the nature of freighter bumping, it is quite surprising to see someone like Apex do the same activity in a very similar manner. Yes, similar. It looks like he made a mistake by ignoring the bumping permit slot, cloaking device, spatial awareness and general vigilance. Moreover, there was nothing in High slots. 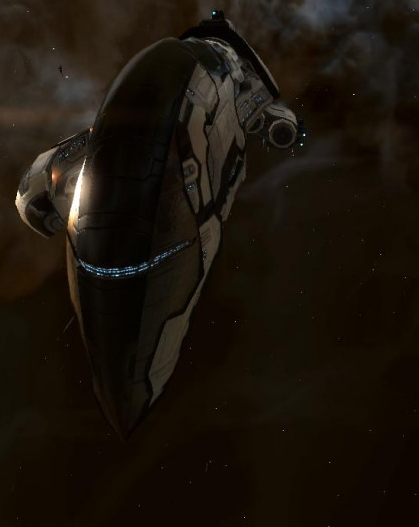 A disgusting sight that can bring nightmares to the engineers and designers of Angel Cartel who worked so much for introducing this epic behemoth to New Eden. What happens when all these dangerous mistakes are made? Content Generators Slania Auduin, Arrtidius, Scott Bacon and Armand Patrouette delivers the punishment by means of advanced Machariel maintenance. With total care, the anti-tanked Machariel vaporized within seconds as a result of this generous intervention. Angel Cartel's faith in Highsec Machariels was restored and the victim was reminded that the rules of EVE apply to everybody: tank your ship and pay attention to your surroundings. As you can see, the usage of valid game mechanics against gankers work much better than sending insults, RL threats or homophobic slurs to them. Anti-ganking through ganking: now that's emergent content. "There are some people who don't want to wait for new mechanics and just gank our Machs. We like these people. 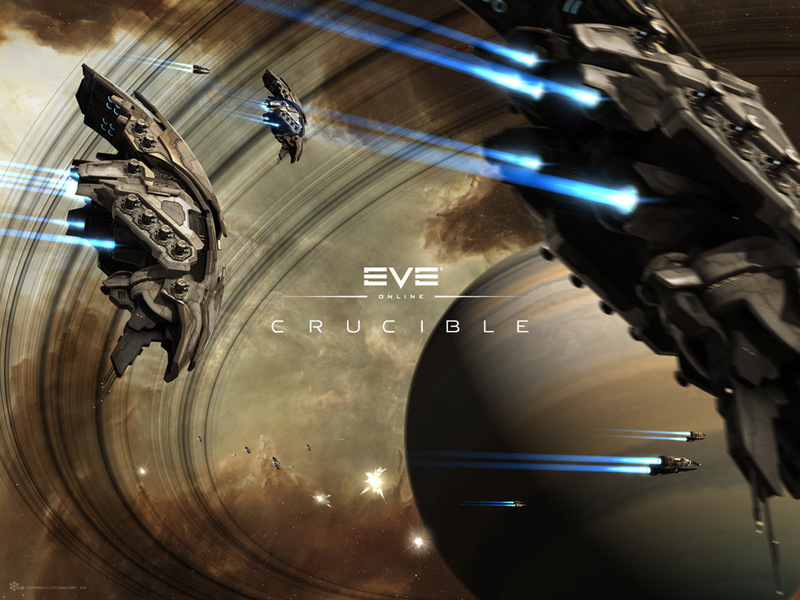 Eve is really a great game if you play it." 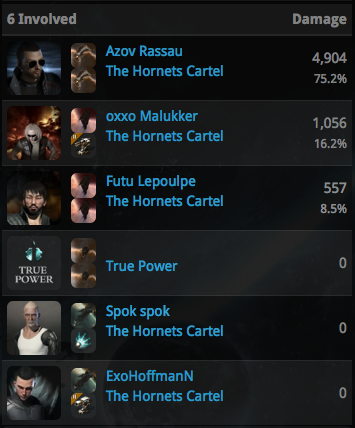 real Anti-gankers are continuing to enjoy EVE by using the already-available mechanics. Player Versus Player. Working as intended. As a former Lowsec outlaw, I know what it's like to jump into Highsec with outlaw-level negative security status. 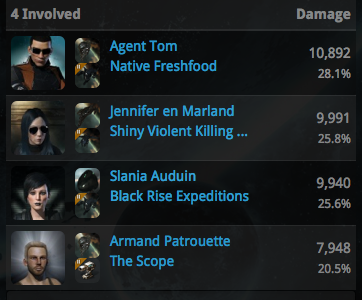 It is possible to avoid faction police, but if a player manages to point you, you're doomed. Some angry carebears claim that they don't have tools to fight back gankers, outlaws and criminals in Highsec. Others take their whining to the next level by declaring that CCP should buff CONCORD and change the game mechanics so that outlaws cannot navigate in Highsec at all. However, it is not by buffing NPC police that Highsec will become a healthy place. Highsec is, and should always remain a place where player interaction matters. Even in the emptiest Highsec system, you can use the available tools to stop the outlaws. Imagine what can be achieved in popular gank centers like Sivala, Uedama or Niarja. Vaajaita is an empty, isolated, "bridge" Highsec system often used by the Lowsec outlaws as a shortcut between different Lowsec systems. This, of course, becomes a great source of entertaining, emergent gameplay. 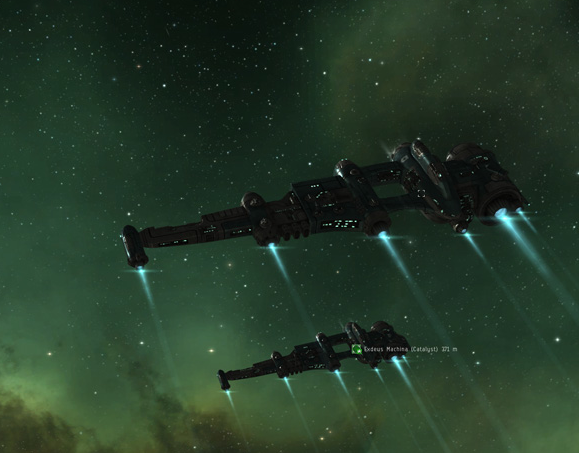 Our insta-lock Skiff was once again patrolling the two Lowsec gates in Vaajaita. This time, I had chosen the Jan gate. A good amount of time passed, with absolutely no sign of illegal passage. However, the generous Highsec Anti-Gankers are known for their never-ending patience. When it comes to teaching fun and emergent lessons in Highsec, our patience is like no other, because we know that it is worth waiting. As the endless amount of minutes passed, someone named RolandoooEvoX, a member of The Vikings of Valhalla, entered local. It could be from any gate. 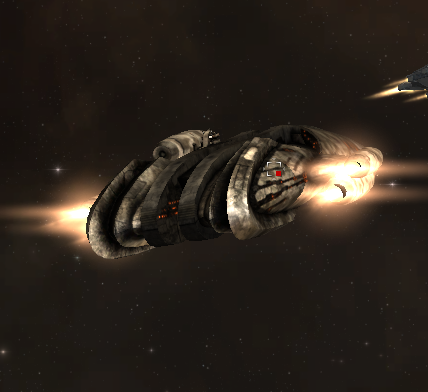 After all, there are 3 stargates in Vaajaita (1 Highsec, 2 Lowsec), and our unique, courageous Skiff can only cover one stargate at a given moment. Or maybe he had just connected at a station in the system. 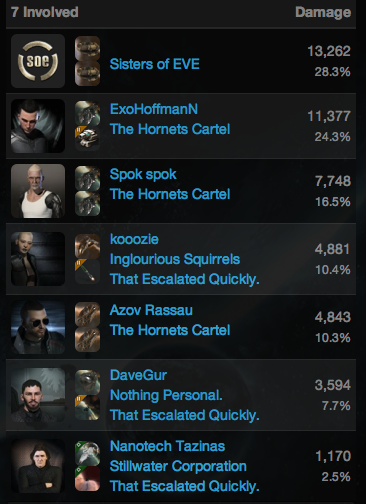 [ 2013.11.16 21:43:45 ] (notify) You have entered Caldari space RolandoooEvoX, where criminals will not be tolerated! Yes! It was our gate. Moreover, he was an outlaw: exactly what our Skiff needs. But what was he flying? RolandoooEvoX didn't decloak right away. 5 seconds… 10 seconds… 20 seconds passed. He probably understood what was about to happen. In these moments, you don't know what ship type is going to decloak (assuming that you don't scout). 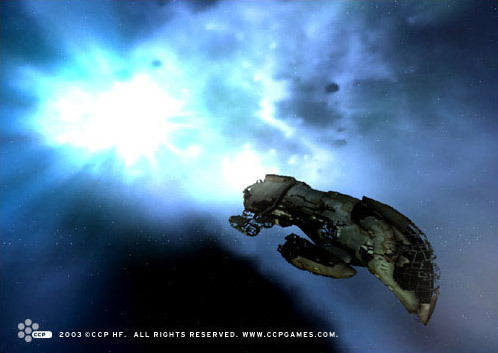 In this case, what decloaked was an outlaw Combat Battlecruiser: a Cyclone. Our Skiff swiftly locked and double-pointed the outlaw. 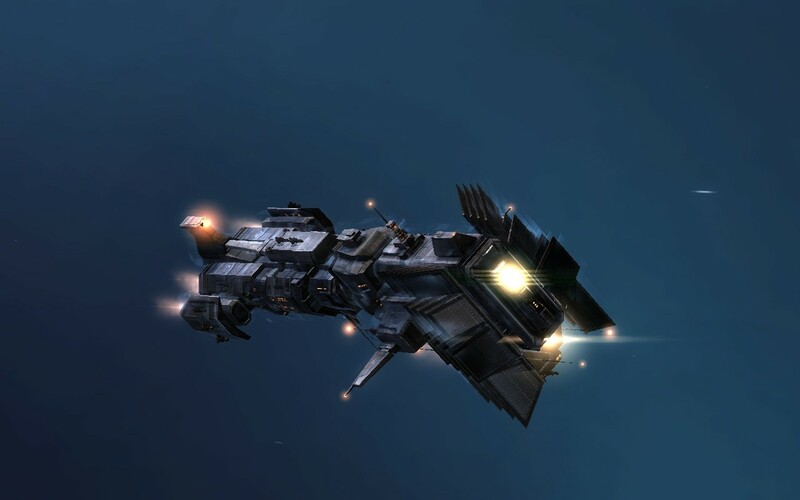 While our Skiff was kindly welcoming the red Cyclone to Highsec with this lesson-teaching warp disruption, Content Generator Caldari Police Vice Commissioner (faction police) arrived, as always, late to the party. The most important role was already done by our Skiff: initial tackling. Meanwhile, even though he knew that he couldn't really tank faction police's DPS, RolandoooEvoX, in frustration, engaged our Skiff. The sounds of faction police were accompanied by the sounds of vicious missiles hitting my Skiff's shields. 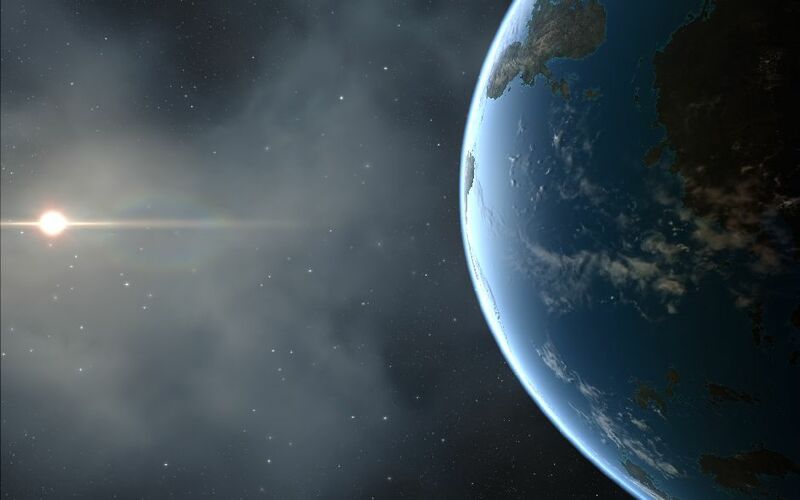 Highsec was once again benefiting from chaos, consequence, excitement, justice and player generated content. Meanwhile, Content Generator Caldari Police Commissioner was busy applying two additional (and not really needed) warp disruptions to the Cyclone. The NPC police forces tend to be stupid indeed. Our capsuleer-controlled mining ship had done the initial and vital tackling like 40 seconds ago. The problem with Rolandooo's missiles is: the Skiff is amazing. It has the tank of a Battleship and the scan resolution of a Crow. It's like magic. RolandoooEvoX not only engaged our Skiff, but he also actually tanked the faction police for a short while. He was a stubborn, determined outlaw. Unlike Currin Trading, he was a fast-thinker. If only he had a ganking permit. 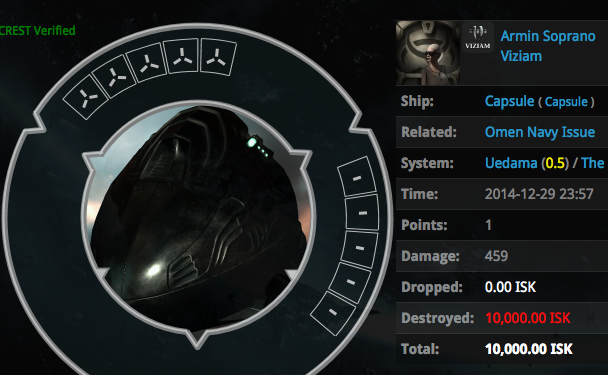 As his Cyclone exploded due to the heavy DPS of Caldari Vice Commissioner, we also noticed that he wasn't as clumsy as Taishan Mandragoran who was mentioned previously. 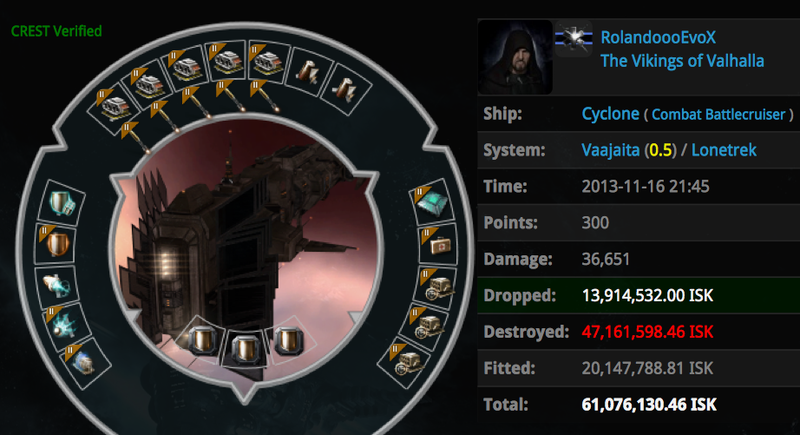 RolandoooEvoX managed to save his pod, and instead of crying or raging in local, he reacted like a healthy EVE player. This is an example of what EVE is really about: consequences, lessons and most importantly, a fun sandbox. 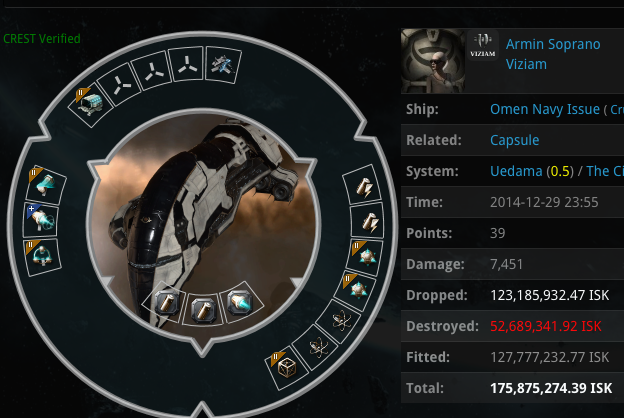 As a Viking of Valhalla, RolandoooEvoX had only wanted to join his friends in Aurohunen who were killing a 1.1b ISK worth Sleipnir at that very moment. In Norse mythology, Sleipnir is the name of the eight-legged horse belonging to Odin, the God ruling over Valhalla. As you can imagine, RolandoooEvoX definitely had to join that kill. He thought that he could freely navigate with such security status in our holy Highsec. However, I won't be interested in an eight-legged horse anytime soon. 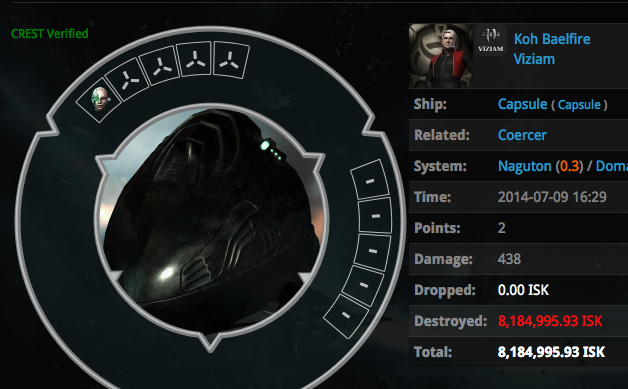 Our Skiff of Doom punished his lack of a proper ganking permit. Both sides had fun, one side lost a Cyclone. Among the dropped loot, there was 1 Spirits and 2 Tobacco. These three items are still kept in our Skiff's cargo hold today. To be honest, I am more interested in Spirits than Tobacco. According to some rumors, some wealthy outlaws were recently seen shortcutting through Vaajaita.